A fungal problem in sycamore trees, beans, and ornamentals where the foliage turns a tan color overnight. Sycamore leaves brown, remaining on the tree. Not normally fatal. Spray Garrett Juice plus garlic tea on emerging new foliage in early spring. Apply The Sick Treatment. Sprays of potassium bicarbonate, garlic and quality neem products are also effective. Avoiding planting American sycamores is the best control. 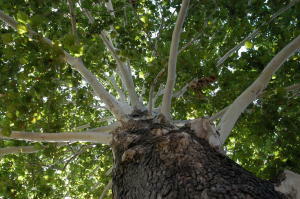 The Mexican sycamore is a far better tree. This disease also attacks beans and ornamentals. The foliage turns a tan color overnight. Control is difficult other than by avoiding the use of susceptible plants. Also called bird’s-eye spot, it is a fungal disease that causes small dead spots with a raised border, sunken center, and concentric rings of pink and brown. Symptoms of bean anthracnose manifest on the pods as circular, black, sunken spots that may ooze pink slime and develop red borders as they age. Thoroughly compost infected plants. Treat the soil with cornmeal and use the overall Sick Tree Treatment. Soil improvement is the best solution. Spray infected plants with 2% hydrogen peroxide, BioSafe or BioWash (to clean plants). Bacterial leaf scorch, not anthracnose is the killer of sycamore trees.